The Division added Classified gear sets. The cool thing is that having a 6 piece set grants very cool abilities. Not to mention each Classified set allows you to re-roll 2 of the perks. I was a member of the reroll addicts in D1 and getting the perfect stats was always a goal. So the Division has opened that up for me. The different DLC's are pretty good too. They added exotics and new areas of the map and made the DZ more user friendly. You have to actually initiate going Rouge and can't accidently shoot someone to go Rouge. Overall it is hard to explain but for instance after a night of playing you could legitimately spend an hour or so going through your gear to make sure what you got wasn't any better than what you had. Just a overall fun experience. But not for everyone. I might try to pick up AC. I have heard a lot of good things about it. But long term, I would love for D2 to make a comeback. My optimism is low but secretly wish it becomes the game everyone comes back too. Just wished it was there from launch. I think that was the problem with so many D1 players in general. We all expected the game to be the greatest creation of any video game ever and when it didn't meet that expectation we felt slighted. So hopefully they get their crap together and get it back to where the community jumps back in and gives it another go. Sounds like The Division followed a similar path to D1 then. Good to hear that it made a comeback to where some came back. I thought that game was going to pull an "Evolve" and be dead in the water. I'll probably move on till late Spring. Hopefully there is reason to come back. Unfortunately my track record with D1 indicates that I may not, after that long away. Only time will tell. I read through the timeline and nothing really "game-changing" stands out to me. The most notable being the 6v6. 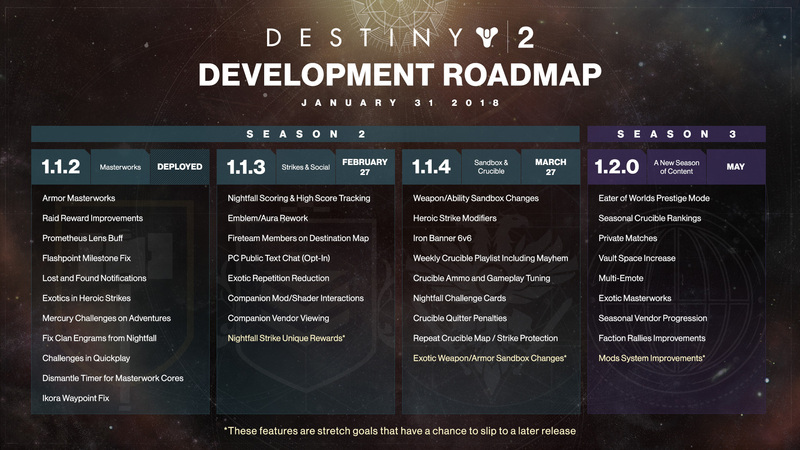 It just feels like a slow and steady build up to where we were at in Y3. Rewarding us with things we already had and selling it as new. I dunno. Maybe this will bring back the player base and freshen it up a bit, but for me.... I'm still going to pass until, bare minimum, things get "new and improved." You have to remember, D2 is very much a product of user input. Random Roll removal was asked for because guns were not balanced. Bungie has a major task to add back the fun to the game and do it quickly. I believe they're on the right track. If the Division can win back players right now, Destiny will do the same. Unfortunately, it won't be overnight and it may take a few iterations and it probably won't be perfect then either. What makes me happy, may not make you happy, etc. Stinking YouTubers!!! Always messing it up for the little guys!!! Yeah I understand what your saying. What they took away is what I loved the most. When I think about static rolls on guns, I think of riding go karts on a track that all go the same speed. Unless you start first you never win or pass anyone, everyone just rides bumper to bumper and stops being fun after the 2nd or 3rd lap. I hope your right that they can turn this game around in YEAR 5! I know, I know. We're beating a dead horse. So I heard there was IB this week or last week? How did it go? Any improvements? Was there 6v6 in this one? I haven't watched any videos because honestly the people I subscribed to in D1 don't put out anymore content, if they do its rare. I actually had fun this IB. I only played 3 days of it as I had to go out of town for my grandson's 4th bday. I played over 50 games and had about a 90% win ratio. I did play with folks from my clan which made it a lot easier, but I found this one more enjoyable. The 6v6 IB doesn't come until the March 27th update 1.1.4 Sandbox Crucible. That is the update that everyone is waiting to see what happens.